Available with data logging, topside, HelmetView™ and twin crystal probe options. MSI™ Measurement Stability Indicator – this is a feature exclusive to the Cygnus. When using the DIVE Gauge in Single-Echo and Echo-Echo modes, MSI™ confirms when a reading is stable by turning the thickness measurement numbers from red to yellow. HelmetView™ – optional remote display. 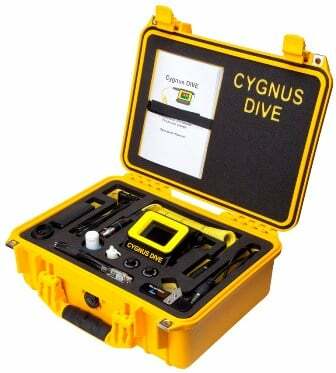 Contact us to find out more about the Cygnus DIVE Underwater Gauge or any of our other non destructive testing equipment, or request a quote online. 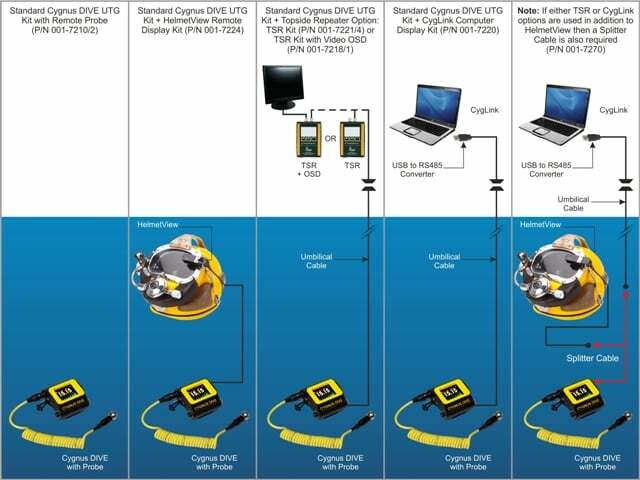 Allows real-time thickness measurements and calibration settings to be overlaid on the dive monitor screen. Also supplied with a hand held repeater unit. The Cygnus DIVE can be connected to a laptop on the surface running Cyglink software. This can then be used to log readings and control gauge settings, for example the velocity of sound. Reports and graphical analysis can then be produced and saved. 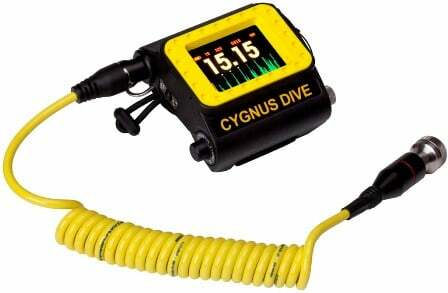 Developed by Cygnus for divers in black or limited visibility water. The small remote OLED display is mounted just in front of the lens on the diver’s helmet. With adjustable brightness, the thickness measurement is clearly visible to the diver. When auto-log is being used, the HelmetView™ display will indicate when the reading is logged. Up to 5,000 measurements and A-Scans can be stored. The “Auto-Log” feature saves each stable measurement meaning the diver doesn’t have to press a button every time a readings needs to be logged. Supplied with CygLink version 4 software.